With six weeks to go until #GivingTuesday, here’s what you need to know. #GivingTuesday is a global day of giving that takes place on November 29th. Created in 2012, #GivingTuesday was started by the Belfer Center for Innovation & Social Impact team at the 92nd Street Y to celebrate and support giving during the holidays. In contrast to the commercial shopping days Black Friday and Cyber Monday that immediately precede it, #GivingTuesday encourages individuals to participate in a charitable act. Entering its fifth year, #GivingTuesday has become a global movement. Last year, 700,000 donors across 71 countries joined forces to raise $116.7M in online donations. What’s in it for my charity? As a global day of giving, #GivingTuesday offers a huge opportunity to increase awareness of your cause and support for your organization while reaching out to new and current donors. 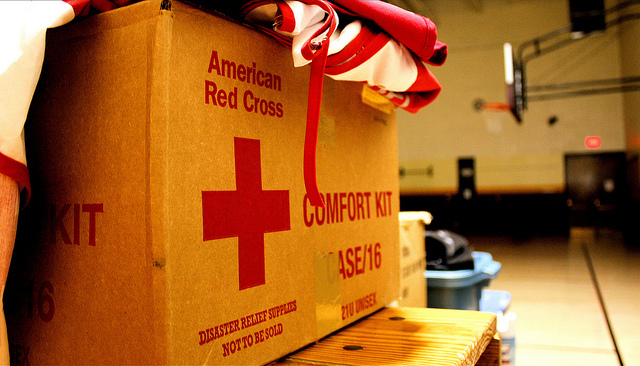 Form a plan – Start preparations early to ensure your #GivingTuesday goes off without a hitch. Set your fundraising goals, train your employees and volunteers, prepare your donor outreach list, and schedule promotional communications leading up to the big day. Take advantage of ready-to-use materials from the #GivingTuesday website that include a free toolkits, sample messages, logos, and more. Tip: Once your page is customized, add our Donate Now button to your website, email signature, campaign emails and social media to link donors directly to your custom page. On #GivingTuesday, share your page with your donors in the morning and keep them updated on your progress via social media and email throughout the day. You can even encourage your most engaged supporters to share these updates with their networks to drive donations! Follow up with donors – While many of your #GivingTuesday donations may come from your regular donors, it’s also a likely that you’ll see new donors showing their support. Once #GivingTuesday is done, take the time to thank your donors, share the final total raised, and communicate the impact their donations will have. This is a great opportunity to engage regular supporters and turn new donors who are passionate about your cause into long-term supporters. Thanks to your giving and support, JustGive sent more than $30 million to charity in 2015! Our charity gift cards continued to be popular in 2015, showing a 300%+ increase thanks in part to a much-improved process for companies and individuals to order gift cards in bulk through the JustGive website. This year, we redesigned our Fundraisers product, making it easier to raise funds for charity through a nonprofit campaign or for a special occasion or cause, an upcoming wedding, or in memory of a loved one. We also improved the Nonprofit Services section of our website to make it simpler for our member charities to use JustGive’s online donation tools to collect and track their donations. And we’re proud to have helped our many partners by developing and supporting corporate giving programs as part of their social responsibility efforts. Here’s a glimpse of our impact—and what we accomplished together— in 2015. We’re working hard in 2016 to do more good, and continue fulfilling our mission to make charitable giving a part of everyday life. The recent Philanthropy Outlook released by the Indiana University Lilly Family School of Philanthropy shows giving is on the upswing and momentum is building. Distribution of total giving, by source, for the years 2015 and 2016 from The Philanthropy Outlook. 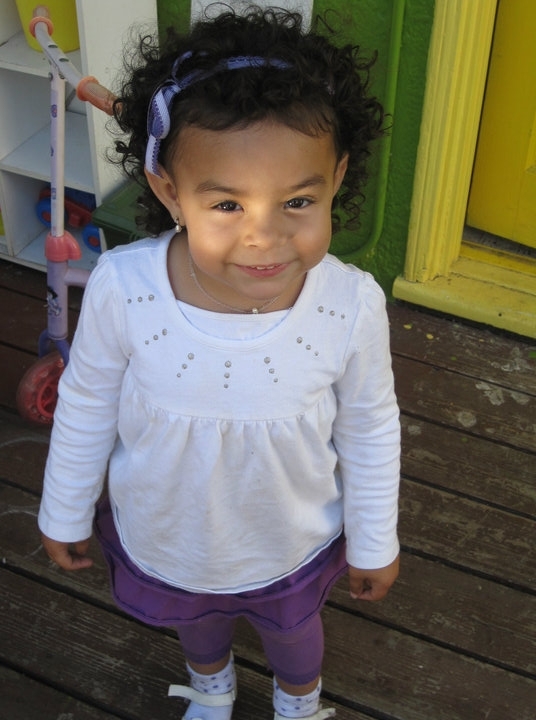 Click to view full size. Here’s a snapshot of the good news presented by the fundraising and philanthropy consulting firm, Marts & Lundy, in The Philanthropy Outlook: 2015 & 2016, based on U.S. donations made to U.S. charities. Giving from all sources is expected to rise 4.8% this year and 4.9% in 2016. The bigger perspective is that each year’s growth will exceed the total giving for the years after the Great Recession (3.1%) and the estimated long-term average for the 40-year trend in total giving for 1973-2013 (3.8%). This giving prediction includes cash and non-cash donations made by individuals, estates and corporations, and grants made by foundations. Giving by Foundations is expected to increase the most – by 7.2% in 2015 and 6.7% in 2016. One contributing factor for this increase is the above average growth in the S&P 500. 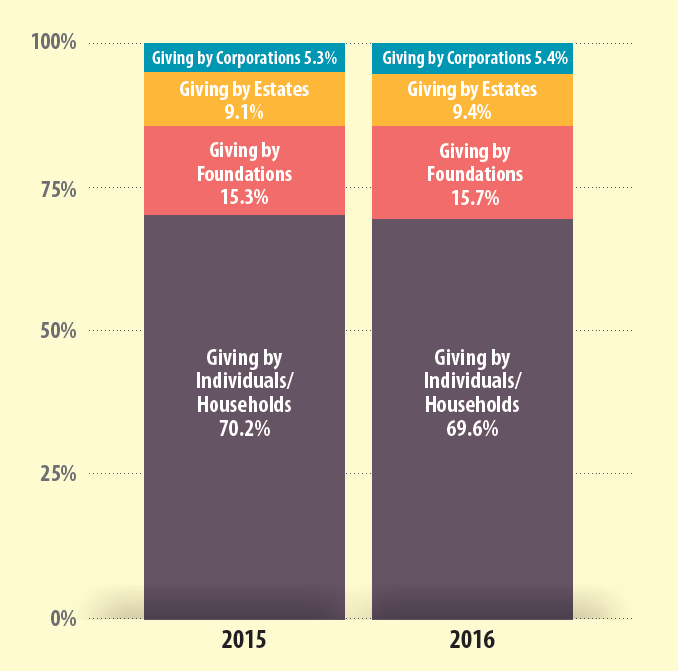 Giving by Corporations follows closely with a 6% rise in 2015 and 4.8% next year. In these two years, as companies hire more employees, growing payrolls may mean scaling back on philanthropy. But researchers say that as corporations save their profits, they give more philanthropically. Giving by Individuals/Households is expected to increase 4.4% this year and 4.1% in 2016. This is more than one percent higher than the historical average—for a source that makes up around 70% of all giving. Giving by Estates is predicted to rise by 2.7% in 2015 and by 6.3% next year. This giving fluctuates widely from year to year, varying mostly due to very large bequests made by a few estates in a given year. To get the full report and read more about conditions that affect the outlook: The Philanthropy Outlook: 2015 & 2016. Interested in increasing philanthropy as a part of your business? Just contact us. To keep up on the latest trends and news in company philanthropy, subscribe to our newsletter. 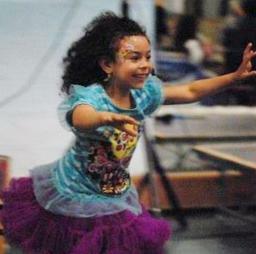 M+R Strategic Services, founded in 1991, helped nonprofit clients raise $159 million last year. Through their work in 2014, M+R reached 33 million people, mobilizing supporters, and moving the media, the public, and decision-makers. Each year, the consulting firm conducts a nonprofit study to identify industry standards for online fundraising, advocacy, and list building. The 2015 M+R Benchmarks Study, conducted in partnership with the Nonprofit Technology Network (NTEN), analyzed the social media practices, website giving, and email fundraising practices of a diverse mix of 84 nonprofits. Information from participating nonprofits—located in the United States, Canada, Australia, and South Africa—was examined in eight categories: environmental, health, international, rights, wildlife and animal welfare, domestic hunger and poverty, cultural, and miscellaneous. This year, data from cultural organizations (museums, libraries, history groups) was included for the first time. A look at the stats below and a deeper dive into the complete study will answer the question for your organization: Are we “normal”? 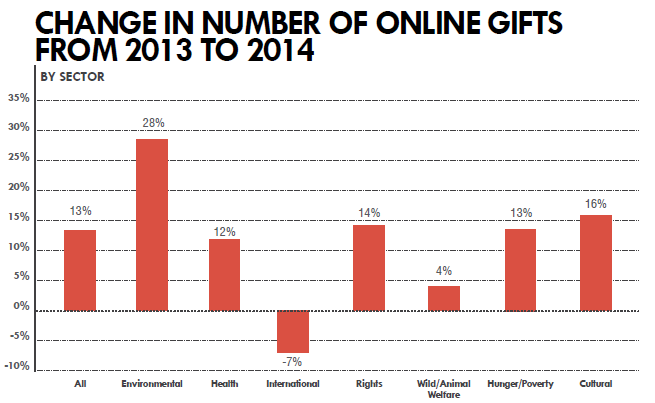 Online giving to organizations in the study increased 13% from 2013 to 2014. This is attributed to a higher number of gifts, not larger gifts. Actually, the average size gift fell by 2% to $82. 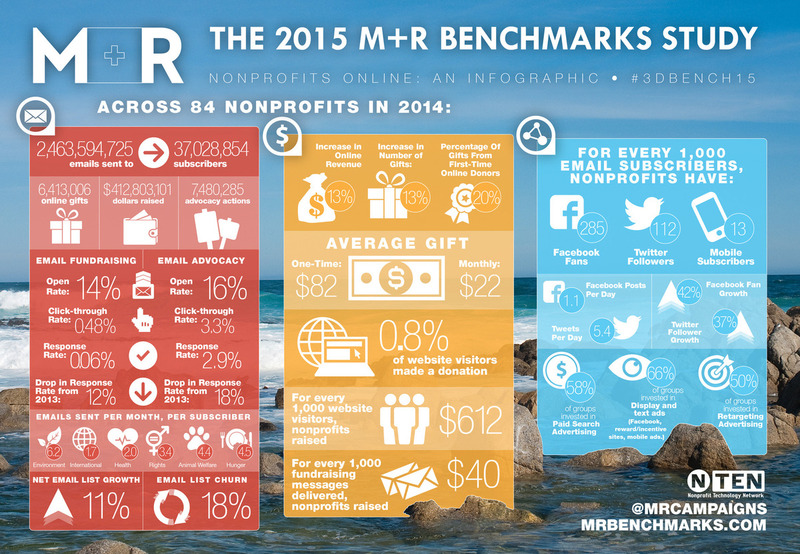 Here are some 2014 key benchmarks analyzed by the channels we use for giving. Results vary by sector, so you’ll want to check out details in the complete study that best relate to your organization. For every 1,000 website visitors, nonprofits in the study raised $612 – and one visitor was worth 61 cents. On average, 7.6 of every 1,000 visitors became donors. This is a slight drop from last year. Monthly visitors grew by 11% over 2013. 13% of visitors to a main donation page completed a gift. Emails continue to be a key communication channel for nonprofits. 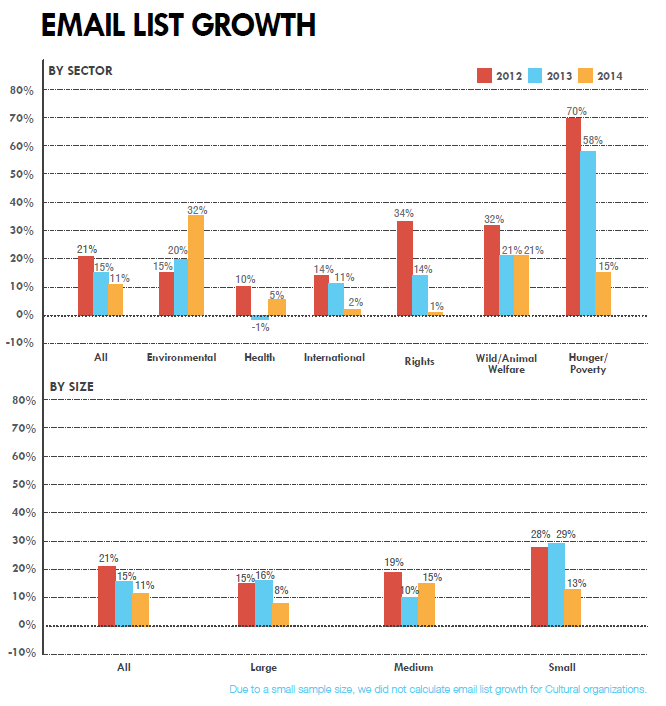 While email lists grew by 11% in 2014, they have been growing at a slower pace the past few years. On average, 22 emails were sent per subscriber per year. And 22% of online revenue is coming from emails—a growing piece of the overall giving pie for nonprofits. Facebook audiences grew by 42% and Twitter audiences grew by 37% in 2014. For every 1,000 email subscribers, participants had 285 Facebook fans and 112 Twitter followers. Post frequency: organizations averaged 5.4 tweets and 1.1 Facebook posts per day. These benchmarks give you good baseline numbers, and an idea of how your organization stacks up. Taking a closer look at your own benchmarks and what they mean best guides what you need to do. 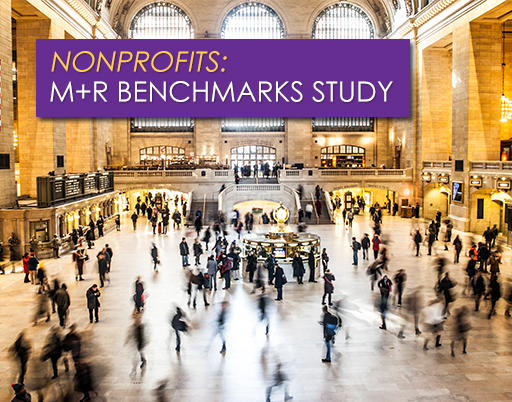 For more on the participating nonprofits, the specifics behind the stats, and to use the M+R tool to calculate your own benchmarks, download the full study. How are your experiences different? And how are they like others? Most importantly: What can you learn from nonprofits who are having success in ways that matter most to you? Working for a nonprofit is often a labor of love. All of us at JustGive have stories about why we work for the public good. 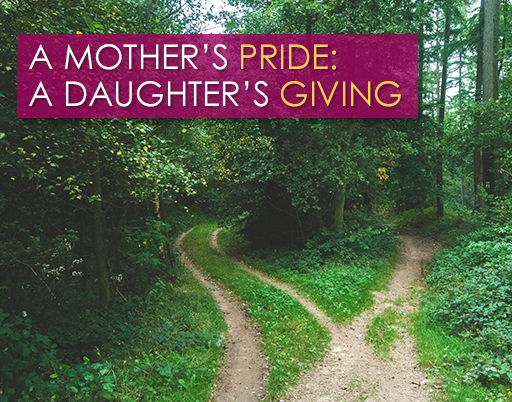 For many of us, it was our Mother’s who instilled a sense of giving back. That’s certainly the case for me. When I was seven years old my Mother founded a nonprofit, Surrey Services for Seniors. Watching her struggle and succeed – before retiring last year – is one of the reasons I made social change a career path. It’s also why this Mother’s Day I’ll let her tell me what her next passion is by giving her a charity gift card. No matter where your Mom lives, there’s a community organization she loves—helping the elderly, caring for animals or giving shelter to those in need. Conveniently find that organization with just a zip code with our Act Locally tool. 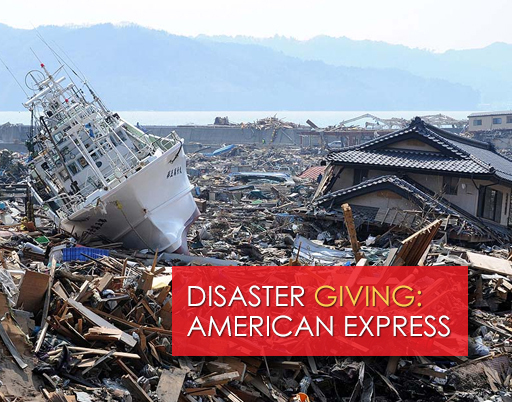 Donate to a charity your Mom cares most about. Add a personal message and JustGive will email your gift in a convenient, earth-friendly way—or print a receipt of your gift and enclose it in her Mother’s Day card. Select and personalize a GiveNow charity gift card and let your Mother choose her favorite cause. 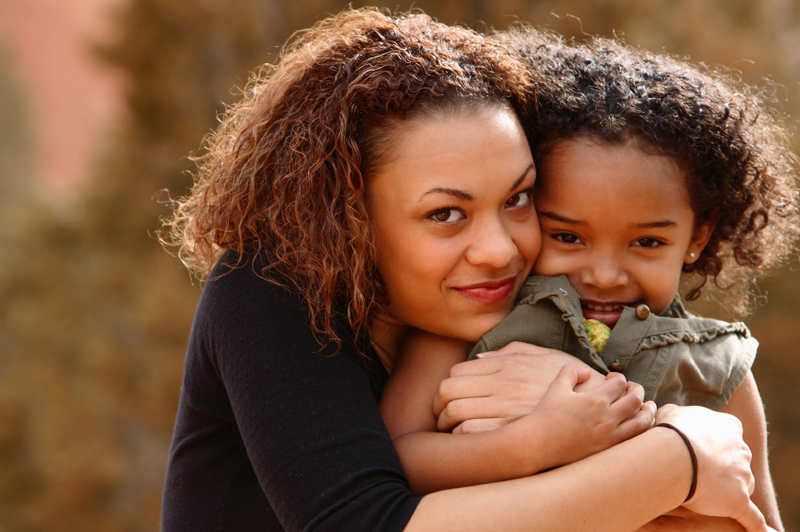 Make your Mother’s gift a monthly donation and provide ongoing support in her honor all through the year. Give her a Gift Collection—a “basket” of four charities that support a cause that’s close to your Mom’s heart. 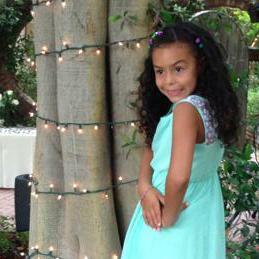 Visit us on Facebook and tell us your story about how your Mom inspired you to give back!